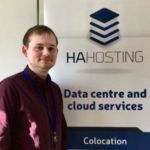 Last week at HA Hosting we were busy moving SAN (Storage Area Network) around in preparation for a bigger push in our Online Backup services. Originally this SAN was used for cloud server storage and were what the cloud servers data was kept. However, they are now running on new storage hardware. In order to properly accommodate our upcoming push for Super-Fast Restores from our Online Backup we repurposed this SAN. This is so that we can tune the performance specific to the needs of Super-Fast Restore customers. The SAN connects to our backup servers over multiple 10Gbit connections. This will be kept in our brand-new computer room, located in a different hall from the cloud servers for an extra element of security, which has A+B power and a 20Gbit link to the existing Data Centre. This will provide primary storage for our managed Cloud BackupUK services, our internal onsite backups and Veeam Cloud Connect services. Which more importantly for you, if you already use our backup services, means that any backups and restores used will be much faster. On top of this we can now offer a fast restore to cloud. And this means we can restore your physical server to a cloud server so that it can still be used if the physical server is damaged, lost or just waiting on spare parts. Another benefit of this switch is that we have a 100% more disk slots available. Which essentially means we have more capacity for future growth to accommodate any requirements you may need in the future. The main reason for this change in infrastructure is due to the rapid growth we’ve been experiencing recently along with our customers’ needs for faster backups and restores, as such, an upgrade was needed. Also, as mentioned before, this also increases our potential to deal with higher demands going forwards. So the change is an all-round improvement for everyone! If you have any questions about our new Backup set up and how it could potentially be used to benefit your business, you can click here to find the relevant information to get in touch with us. We are more than happy to answer any questions or queries you may have. *It’s literally impossible to hold the actual data in your hands.